Book in advance to avoid disappointment. Due to high volumes of demand, websales may not be available at time of day release. The Edinburgh Ceilidh Club bring you Edinburgh’s best regular ceilidhs. 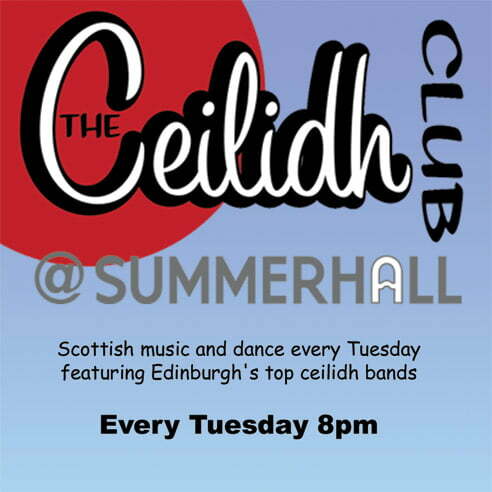 Every Tuesday evening we have the best of Scottish ceilidh bands at Summerhall. The bands have a caller who will teach the dances, so the event is great for everyone from complete beginners to experienced ceilidhers. Come and experience Scottish dance the way its meant to be! Follow Edinburgh Ceilidh Club on Facebook for more information about who will be playing each week. Please Note: Limited number of tickets on pre-sale. Booking weeks in advance is advisable, especially for large groups. More tickets may be released at 2:30pm on the day of the Ceilidh at the box office and from 3pm online. Strictly no phone bookings for this additional release of tickets.